Despite being my 13th cover, I was happy with the concept and composition of 'The Seeds of Death' so I didn't want to redesign anything for the Revisitations 2 version. But there were a few areas of the original execution that I was happy to redo. While the Earth and Moon are the same, I redid the starscape using the Glitterato plug-in from Flaming Pear. I also recreated the T-Mat beam using newer brushes to give it more texture. I was quite pleased with the colourisation job on Slaar but thought I'd since seen a higher quality copy of the black-and-white photo. When I looked for it in my book and magazine collection I couldn't find it, however, so merely tidied up my original work a little. Then I discovered the shot I was after on my hard disk which, while a bit grainy, had more detail. As there wasn't a great degree of colour variance required, I recoloured this from scratch, rather than simply relaying the newer mono shot over my original colour layer. One thing I did want to update was the rather clumsy glow around Slaar, recreating it again with brushes. Similarly, I created a new 'bubble' brush for the foam, this time having more knowledge of how to vary the application of brushes to make it more effective. 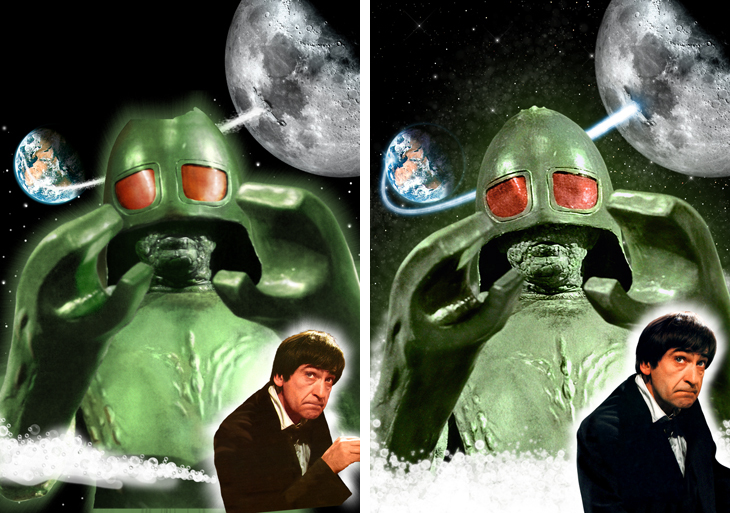 When first doing my covers, for the Sixties stories I tended to use whatever colour photos of the Doctor fitted the composition, rather than specifically using shots from the story in question, as I had yet to develop my colourisation skills. In this instance, it was a photo from 'The Ice Warriors'. Revisiting it, I couldn't find any images of the Doctor from 'Seeds' (at least, not without him covered in foam! ), and given the original shot was from a related story and suited the design perfectly, I was happy to reuse it. The only copy I could find was the same as I originally used - the cover of DWM 54 - but I rescanned it and edited it from scratch, once again painting out the magazine cover lines and recreating his shoulder. This time I painted out his hand as I decided it looked a little odd when you couldn't see the control panel he's working at in the full photo. Finally, at the last minute, I remembered there were photos of the 'Seeds' moonbase on the DVD and, as I could now do screengrabs (the computer I began making these covers on didn't have a DVD drive), I used these to replace the 'Moonbase' moonbase I'd originally used. Comparing the original and remastered illustrations below, you can see that in the early days I didn't necessarily fill in gaps in the composition that I knew would be covered by other elements of the final cover, whereas now I try to do full illustrations just in case I ever want to repurpose them.